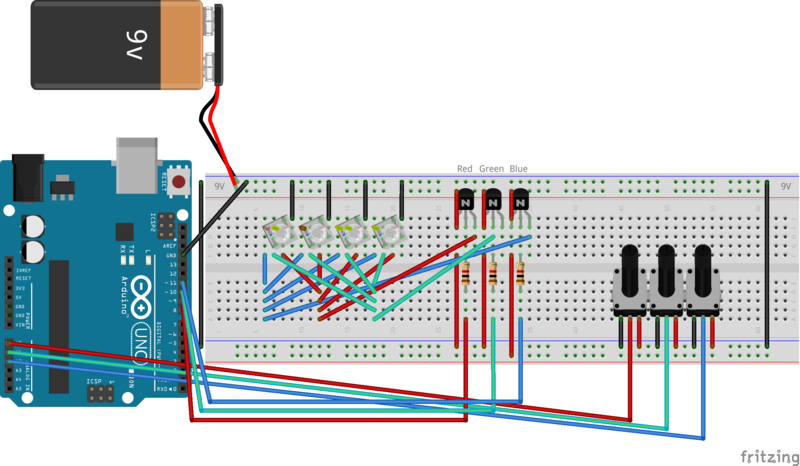 I'm trying to design a mood light system using 4 RGB LEDs which will be powered by an external 9V source and an Arduino for processing. What I was expecting is that the PWM output of Arduino would regulate the emitters voltage between 0~9V therefore being able to dim the LED with my pots. What I have instead got is that the voltage is 0.7V short of what the base is receiving from Arduino and the voltage supplied to the collector is being ignored. In fact, I can even disconnect the 9V battery, and the LEDs would still be lit. From a previous question, I believe this is emitter-follower behaviour? Is there a way I can re-wire this and get the expected behaviour? Or will I need to get some different parts. I got given the wrong LEDs (common cathode instead of anode) but the shop isn't open for another few days to go get a replacement so I'm trying to make do with what I have. Please ignore the lack of resistors between the emitter and LED. I have omitted them for simplicity. Things regarding a high side switching of a voltage higher than the control voltage are not as simple as they seem. When the I/O pin is LOW the voltage to the base will be 0, that means that the Vbe will be 9v and since it is >0.7v the transistor will be on. When the I/O pin is HIGH the voltage to the base will be 5v, that means that the Vbe will be 4v and since it is >0.7v the transistor will also be on. So basically that configuration can't work as a switch because the transistor will always be on. The problem is that in this case the emitter will follow the base voltage when the transistor is on so for 0 and 5v control voltage you will get 0 and 4.3v output irrelevant of the voltage connected to the collector (within transistor specs of course) which may ot may not suite your specific application. Another alternative is to use a device like ULN2003/2803 but intended for high side switching. Such a device is UDN2981 which has 8 source drivers like the following and can be used as a high side switch controlled by TTL level logic. Quickest solution is use PNP transistors for "high side" switching and invert your PWM timing. I keep a bag of 50 or 100 2N3904 (NPN) and 2N3906 (PNP) for these situations. You can try using a split supply. Remove the jumpers from the LEDs to ground. Take a second 9V battery and connect the + terminal to your system ground and the - terminal to the LEDs common. This forms a plus and minus 9V supply and lets the LEDs draw current from "below 0V". Move your current limit resistors to the collector side of the NPNs. I think this will work, and if not, shouldn't hurt anything. Not the answer you're looking for? Browse other questions tagged arduino led transistors pwm or ask your own question. Common cathode RGB LED Cube: Can/should it be done?